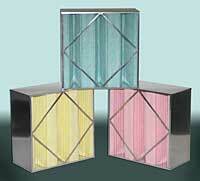 The Riga-V from Camil Farr is a high efficiency air filter with rigid-filtration performance. The key to the filter's economical performance is a high-lofted synthetic media in a proprietary V-pleat configuration that produces optimized performance. Benefits include superior dust loading and airflow characteristics, for longer service life and lower average energy costs. The frame components create a rigid media support system to ensure dependable filtration performance under varying airflow conditions. The Riga-V's compact, efficient design also weighs up to 30 percent less than similar products for ease of handling and disposal. The filter comes in a variety of popular sizes in either box style or peripheral header configurations.